Scotch Corners and their "Scottie Dogs"
Growing up as a young child, discussions about the Sinclair Family or the Sinclair Clan were commonplace throughout my home. For quite some time, my Grandpa Mac was involved extensively with the Clan Sinclair Association of Canada. One of the things my Grandfather enjoyed tremendously about being involved with the Clan Sinclair Association, was the role he played in maintaining the association’s newsletter. I also remember, on occasion, my Grandparents taking me on Sunday drives from our home in Kingston Ontario to a place called Scotch Corners (near Carleton Place). I was told how this was the place where my Sinclair ancestors had settled in Canada. Later on in life, I discovered an article that was written by my Grandpa Mac that talks about the Sinclairs of Scotch Corners (Click here to read) and while I won’t reproduce the whole text, I will summarize some of the key points. In 1822 John Sinclair and his bride, Sarah Black together with two unmarried brothers, Colin and Alexander, sailed from Tobermory (presumably near Inverary), June 14th, among 64 passengers on the sailing vessel Pilgram (or Philgram). They arrived at Quebec on August 22nd and thence to Ontario. John received a land grant in Lanark County, Beckwith Twp. Colin got land in Carleton County, Torbolton Twp. but shortly moved to Beckwith Twp. adjoining that of his brother John. Alexander was quite a bit younger, eventually acquiring his farmland in the same Township a few Concessions away. The district in Beckwith Twp. is called Scotch Corners, and there is a family cemetery located on a small parcel of land from what was John's original land grant. John and Colin along with several of their family members and a few neighbours are buried there. Alexander was buried at Almonte, Ontario. In March of 2006, my Grandpa Mac passed away, and one of the things that was left to the family was a large cedar beam that he had somehow had transported from the remains of the Sinclair homestead at Scotch Corners to his home in Kingston Ontario. Each of Mac’s 4 children (Bob, Nancy, Doug, and Carol) were left a small piece of this cedar beam, and being that my mother (Nancy) had passed away in 1988, my sister Jill and I were each given ½ of her block of cedar wood. It was great having this piece of history from Scotch Corners, but I had a dilemma. The wood was in Ontario and I was living in Newfoundland. So my father-in-law (Ron Coleman – originally from Smith’s Falls, ON – not too far from Scotch Corners) very kindly agreed to safeguard this wood for me. So here we are in 2014, 8 years since the death of my Grandfather and 192 years since John and Sarah settled in Scotch Corners. I was attending a family reunion event, and my father-in-law comes up to me and hands me a small box and simply says, “sorry these took so long.” I opened the box and almost fell to the floor. Inside the box was a set of wooden “Scottie Dogs” made from the cedar block from Scotch Corners. My father-in-law, had chosen to use a pattern that had been passed down to him by his father (Howard Coleman, also from Smith’s Falls, Ontario - a master carpenter and carver). I cannot put into words how special these little dogs are to me, not only do they represent a historical connection to my Sinclair ancestry here in Canada, but they also capture the artistry and craftsmanship that is a key element of my wife’s (Marcia) family history. The final part of this story is that I couldn’t think of a better way to say thank you to my dear friend Steve St. Clair for all of his hard work and dedication to the Sinclair Family. 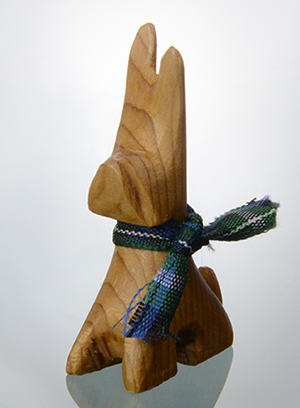 In March of 2014, I had the good fortune to be able to hand-deliver to Steve one of these hand-carved Scottie Dogs with their Scotch Corners ancestry, and from what I can see, this dog has found a loving home.